First town planning act was implemented in 1915. -This provided for planning of small areas around the city, which is growing or proposed for growth through Town Planning Schemes. Act was modified in 1954. -This Act provided for preparation of development plan (master plan) for the entire city along with detail planning through T.P.Scheme. The recent version of the Act is of 1976. -To day we have provision for covering areas beyond city limit. 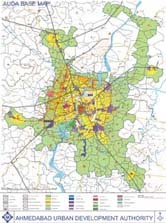 Act provides for delineating urbaniseable area and constituting Authority. It makes possible to take possession of land for roads as soon as a Draft TP Scheme is sanctioned. AUDA can recover cost of infrastructure provision in the form of land. This method of cost recovery is now widely accepted by land owners/ citizens. Preparation and Implementation of TP Schemes with usage of new advanced technologies. Total station survey are conducted right at start for upcoming TP Schemes. Computerized preparation of TP Schemes. Prahladnagar -a model TP Scheme on previously reserved land in the south-west periphery of the city was taken up first. The Scheme brings 162 hectares of planned and serviced land into the market which was previously reserved land. Development of infrastructure through self financed and self sustaining mechanisms of TP Schemes from saleable plots allotted to Authority. Roads,Water Supply, Drainage and Street Lighting has been executed. 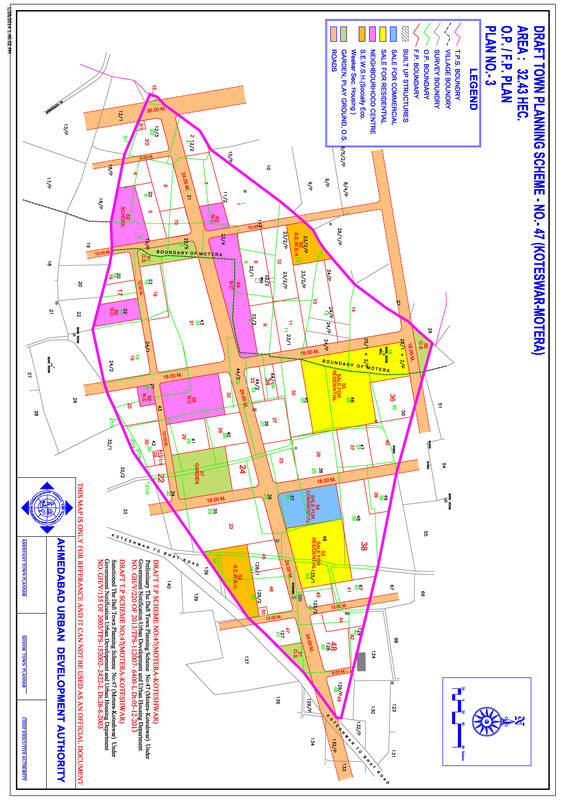 From 1978 to 1999 (20 years), 76 Town Planning Schemes (12724.2 ha.) were implemented. From 1999 till date 83 TP Schemes ( 13376 ha.) has been completed.